DONGGALA - Led by the Director of Energy and Environmental Engineering of the Directorate General of Electricity at the ESDM Ministry, Munir Ahmad, team of the ESDM Ministry's Electricity Inspector and together with the PLN emergency response team, this morning, Wednesday (3/10) again carried out inspections of electricity installations and infrastructure repair efforts for recovery electricity supply at PLN Rayon Donggala, Central Sulawesi Province. Munir reported, the condition of the Electricity System in Palu after the earthquake was gradually recovered. Until Tuesday (2/10) PLN has managed to recover 30 percent of the electricity of Palu City and its surroundings. Several power plants that were previously extinguished were also ready to operate. One of them is the Silae Diesel Power Plant (PLTD) with a capacity of 10 MegaWatt (MW). In addition, the PLTD Pasang Kayu which supplies electricity to public facilities including hospitals has also operated in parallel. There were 7 substations (GI) affected where 2 GIs were operating namely Poso and GI Pamona GI, while the other 5 GI were in the recovery process, Parigi GI, Talise GI, Sidera GI, Silae GI and Pasang Kayu GI. "The Sidera and Talise GI are expected to be immediately normal so that in the near future electricity from the Poso hydropower can be distributed to customers in Palu and surrounding areas," Munir said. Repairment also continue to be made on the Pasang Kayu GI, Silae also Parigi. "It is hoped that all GI can return to normal as soon as possible," continued Munir. 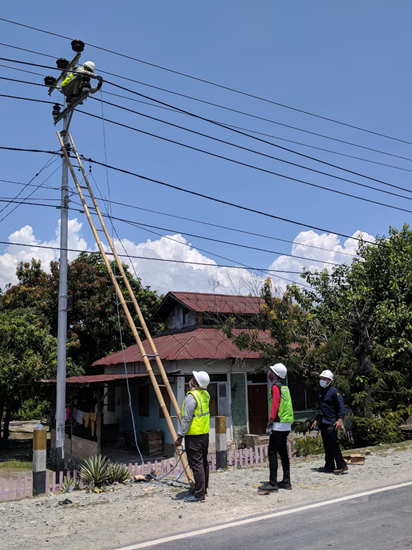 Previously, PLN also reported that electricity had flowed to Radio Republik Indonesia (RRI) Palu, Korem Tandulako and Hospital Safety Center. 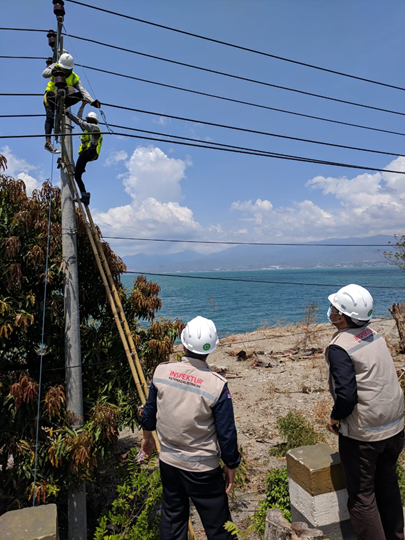 Even on Monday (1/10) the Indonesian Red Cross (PMI) in Palu also received electricity services. PLN succeeded in turning on electricity 4 days after the earthquake, faster than initial estimates. This condition will continue to improve with the removal of 300 joint teams from various PLN work units. "For areas that have not recovered electricity, PLN supplies electricity using generators, especially at Wirabuana Hospital, Undata Hospital, Bhayangkara Hospital, then gradually PLN, in line with the recovery of transmission and distribution infrastructure, fulfillment of the electricity needs will be fully absorbed from the Palu electricity system , "said Sulawesi Regional Director of PLN, Syamsul Huda in his written statement on Tuesday (10/2). There were 15 generator sets installed in Donggala which were scattered in the District Office Complex, Complex Gn. Bale, and the Chinese Grave Complex from Watampone Area, Palu Mayor's Office from Gorontalo Area, Wirabuana Hospital, Undata Hospital and Bhayangkara Hospital. While the other 13 generator sets stand at Luwuk Area Offices (1 unit), Gorontalo (10 units) and Toli-toli (2 units). A total of 45 generator sets are on their way to support the Palu electricity system and its surroundings. 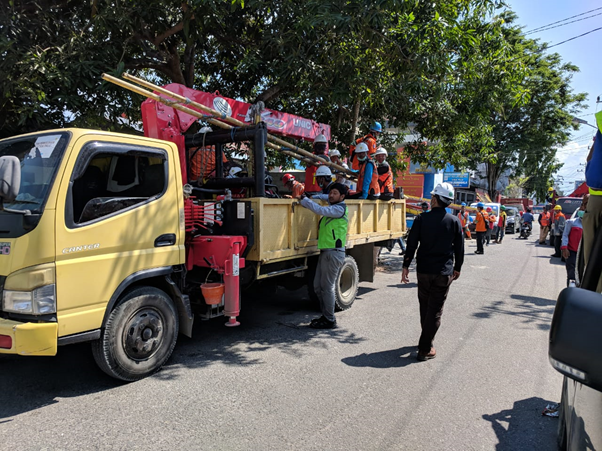 As an initial effort to revive Palu's economy, PLN has delivered 100 kW of electricity to the Gajah Mada street shopping area. PLN hopes that this electricity can be used by the shop manager to start trading to move / restore the economic activities of the community.